All the details on the first Animal Crossing game coming to Nintendo Switch, including information on the Animal Crossing Switch release date. Animal Crossing is coming to Nintendo Switch. It's official! Nintendo has finally revealed that the much-loved living and friendship simulator is making its way to the Nintendo Switch in 2019. In this guide to Animal Crossing Switch, we'll take a look at the confirmed Animal Crossing Switch release date details, detail the Animal Crossing Switch trailer, and talk about Tom Nook. The Animal Crossing Switch release date is set for 2019. Announced during Nintendo's September Nintendo Direct on September 13, we now have a fairly loose release window for Animal Crossing Switch. While we don't know the release date exactly, we can say that the Animal Crossing Switch release date will be in 2019. It's unlikely we'll hear any more specific Animal Crossing Switch release date info for a while, but we'll let you know when Nintendo gives the game a firm date. The Nintendo Direct on September 13 included news that Animal Crossing's Isabelle is coming to Super Smash Bros. Ultimate. Following this reveal, a short video featuring Animal Crossing loan shark Tom Nook revealed that a brand new Animal Crossing is coming to Switch in 2019. 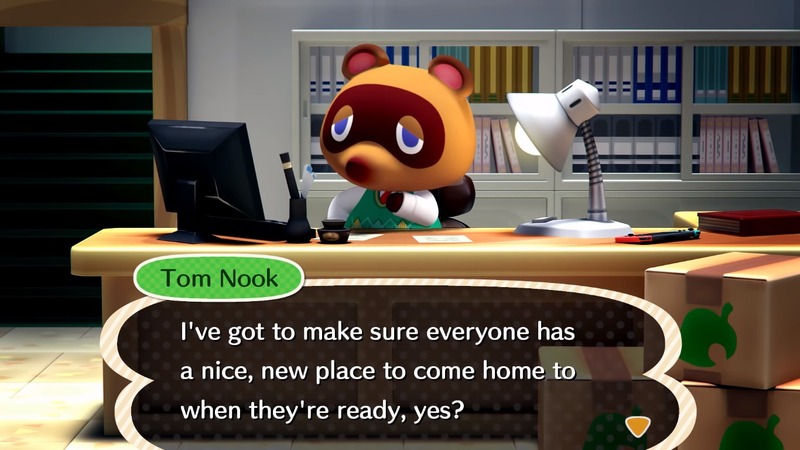 Nook says that he needs to get to work on making sure the animals currently camping and smashing have somewhere new to live when they return. The Animal Crossing Switch reveal trailer ends with the news that the game is releasing in 2019. Details on Animal Crossing Switch are incredibly thin at the moment. We pretty much only know that the game is coming to Switch in 2019. Tom Nook is sure to return, given than he announced the new game, and Nintendo has said that Animal Crossing Switch is a "new mainline" entry in the series - so don't worry about this being an amiibo focused spin-off. Animal Crossing has been a popular Nintendo franchise since 2001, although there have been surprisingly few mainline entries in the series. In fact, the previous mainline Animal Crossing game released for 3DS in 2012 (2013 in North America). Between then and 2019's Animal Crossing Switch the franchise saw three spin-off games. That's all we know about Animal Crossing Switch. Given that the game is probably a year or so from release, we'll keep this page updated with more info as and when Nintendo reveals more.